Ready for action at Snoasis Lounge in Gstaad. Photo: Alyssa Shelasky. The grand hotels in Zurich and Gstaad offer more than gazillionaires and gruyère, though no one is knocking either. Alyssa Shelasky has a girls-gone-wild Alpine adventure. ZURICH and GSTAAD – I have long said that despite my access to incredible food and restaurants everywhere, at the end of the day, I'd always prefer to be left in silence with good cheese melted on fresh bread. 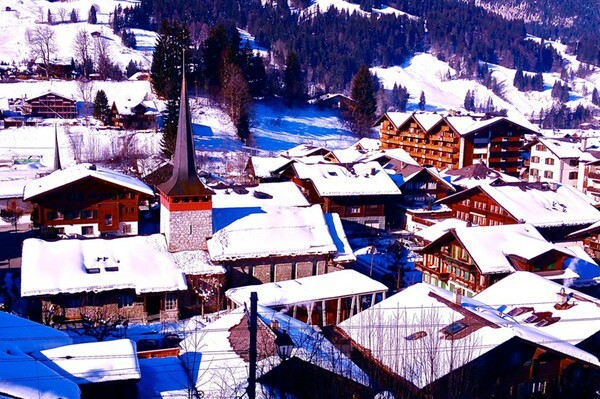 More specifically, Zurich and Gstaad, two perfectly harmless universes comprised of handsome mountains, sapphire skies, and cement-white oxygen. Both flowing, ever so briskly, ever so seriously, ever so Swiss-ly with fondue and raclette. Along with three girlfriends, each with fine taste and fox collars, we first checked into The Dolder Grand in Zurich. The hotel staff — pleasant — if precise, welcomed us with as much warmth as their Swiss-German genetics allowed. If they are Montblanc Meisterstücks, I'm the silver metallic Sharpie you sniff to get high. Dolder Grand Hotel with entrance sculptures by Arnoldo Pomodoro and Keith Haring. Photo: Heide Betz. 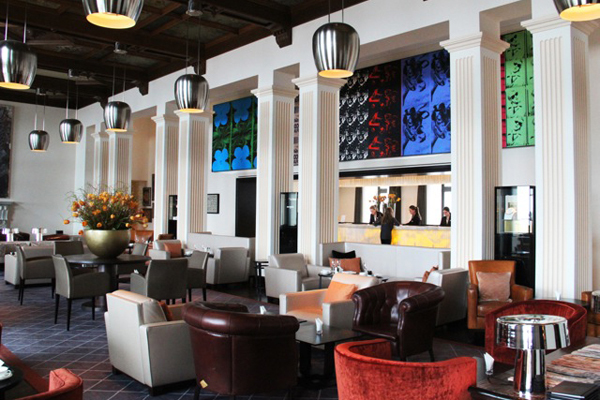 Dolder Grand Lobby Bar with Andy Warhol's Big Retrospective. Photo: Heide Betz. The Dolder rooms, recently refurbished, can best be described as opulence meets electronics, Downton Abbey banged by Bang & Olufson. Every inch of the suite (and by extension, the hotel) is splendid and high-end, even if it takes an MIT degree to turn on a damn light. As for the breathtaking view of Zurich from my room — mon Dieu! — my jaw dropped in my Frette bathrobe. The one-two punch at the Dolder Grand is the art collection, complete with work by Fernando Botero, Camille Pissarro, and Andy Warhol, and a 43,000 square-foot spa with the nicest hotel gym I've ever seen. For my Shiatsu-bamboo massage, a woman laid me on a mat and whipped me with a broom. Weird. Yet wonderful. As for the social scene at The Dolder Grand, the lounge and bar feel quite, um, Protestant, at first. But the crowd, a combination of prominent locals and wealthy hotel guests, loosen up eventually. One night, Duran Duran played at a private party for an enigmatic glamazon named Vanya. Another night, 15 married millionaires kept us entertained until six in the morning. Proscht! Old town in Zurich. Photo: Heide Betz. The fondue tram. Photo: Alyssa Shelasky. The hotel is a short tram to the main town of Zurich, where shops are luxe and streets are clean. There are warm chestnuts, famous chocolatiers, an, um, cheesy fondue tram that whisk you around in tipsy, touristy style. Just behind the hotel is a grand ice skating rink, Eisstockschiessen, where curling classes are offered (yah!) and just behind that is Restaurant Adlisberg, a former farmhouse that serves excellent Swiss specialties. En route to Gstaad. Photo: Heide Betz. 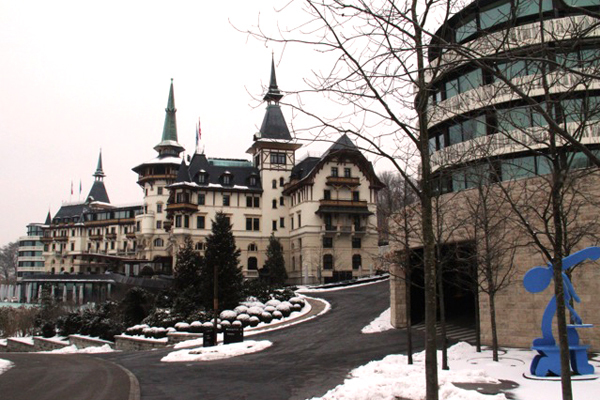 We got a few hours closer to France and checked into Gstaad Palace, an enclave of extraordinary wealth and unspeakable Russian sable. Walking into the commanding chalet, even my newly purchased leather pants experienced an inferiority complex. Amidst the heiresses in Hermès and runaways in Rodarte, Helmut Lang feels lame. 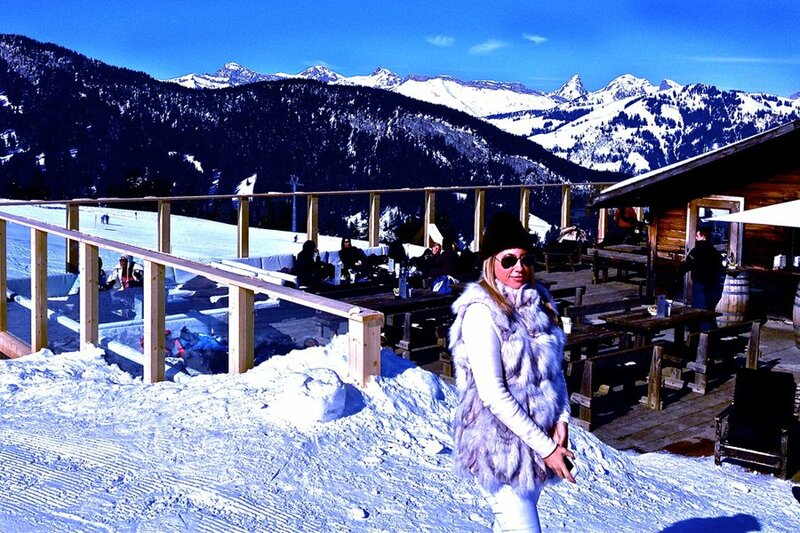 The apres-ski scene in Gstaad is, unsurprisingly, outstanding. 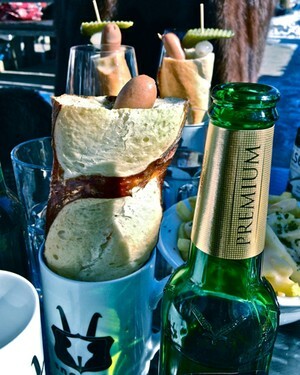 I don't ski, so I ate fondue-drenched fries while perched at Snoasis, a little hangout on top of Mount Eggli. (If you do ski, this mountain is the place to be.) Sipping bubbly in the snow, with a hot water bottle on my bum ... that moment was embarrassingly awesome. 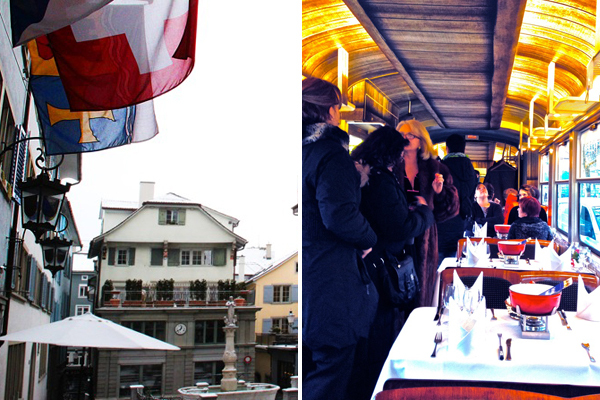 Dinner at Le Grill, one of the five restaurants at Gstaad Palace, was idyllic too. Roman Polanski was at one table, the Jonas Brothers at another. The famous GreenGo Club was closed, which is probably a good thing, as trouble tends to find me in subterranean discos where Madonna likes to mingle. A wiser woman would have pursued any of the princely men drinking Belvedere martinis in the lavish lobby bar. But I, naturally, kept busy with the one trust fund-less gent in Gstaad. Not that I have any regrets. Money begets money; and so it goes with the broke and happy. 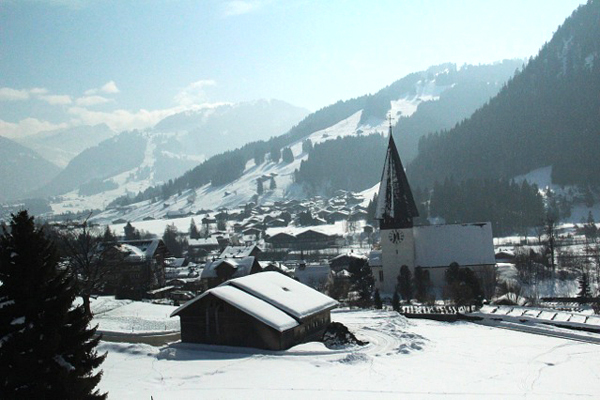 Gstaad village. Photo: Alyssa Shelasky. At the Gstaad Palace and similar luxury retreats in town like The Alpina, a Diet Coke costs 12 dollars and a dirty look; and fighting a minibar charge is like stepping on a court with Serena Williams. But there are a few places to go for a taste of normalcy. The Fromagerie at the Gstaad Palace is actually affordable, as is Rialto, the Italian restaurant on the Promenade. The newest It spot is 16 Bar — stylish and somewhat economical. Bottom line: These hotels will sweep you away and spoil you rotten. And there isn't anything wrong with that. Of course, if budget travel is your thing, Switzerland is definitely not neutral. Alyssa is a food and travel journalist and the author of Apron Anxiety: My Messy Affairs In and Out of the Kitchen. You can follow her on Twitter @ApronAnxiety. She travels for the simple reason that she just can’t get enough.